Live Well at Home | Old Dominion Innovations, Inc. Thanks to modern medicine, American adults now live an average of 78 years. While it’s wonderful to gain the wisdom and experiences that accompany aging, some of it’s side effects are less endearing. For most of us, aging comes along with physical challenges that can make life much more difficult and even dangerous. Yet we are aware that the emotional effects of growing older are just as difficult, in some cases even harder, than the physical changes. Leaving home for assisted living or nursing care is rarely desirable for an older person. Staying in your own home as you get older is called “aging in place” and it is an almost universal wish among older populations. Planning ahead can make home a safer place to be, for longer. It’s never too soon to start considering what you may need, and whether a home remodel for accessibility is right for you. Remodeling for disability is one of those things too few of us consider ahead of time, even though most of us will face physical challenges at some point in our lives. 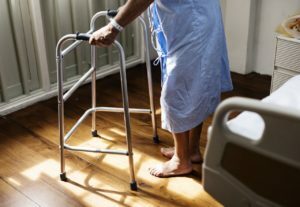 Adapting your home for aging in place or remodeling to accommodate eventual disability can make all the difference in your quality of life down the road, but it can be hard to know where to begin. One way to begin planning is to look at any illnesses or conditions that you or your family member might have. Talk with your doctor about how these health problems could make it hard for someone to get around or take care of him- or herself in the future. Falls are one of the most preventable causes of lost independence. They’re the top of injury-related visits to the emergency room in the U.S. and cause 75% of accidental deaths in people over 65. Yet only 20% of seniors have planned ahead to create a home that helps them safely age in place. Simple home modifications keep seniors safer and reduce fall risk despite the physical changes that come with normal aging, like diminished physical strength, poor balance, and lowered sight and hearing. Would a few changes now make your home easier and safer to live in down the road? Things like a ramp at the front door, grab bars in the tub or shower, nonskid & soft floors, more comfortable handles on doors, drawers, or faucets, and better lighting can make life at home easier and safer. Roll in showers can replace tubs. Low maintenance or no maintenance exterior upgrades can eliminate chores like cleaning gutters. Widened hallways make room for wheelchairs and walkers. Lifts on stairs or in the bathroom can be installed to help you manage those areas. Intercoms systems can help you communicate from room to room or alert caregivers that someone needs help. The bonus is that these modifications really pay off at resale, too! Contact us today if you’d like to explore how simple home modifications can help you or a loved one stay safely at home. ODI can modify bathrooms and kitchens, widen doorways, install lifts, ramps and grab bars, move walls, and more. Our remodeling experts will work with you to find the solutions that will work best for your needs long term while keeping you where you want to be. Sunroom Season is Just Beginning!